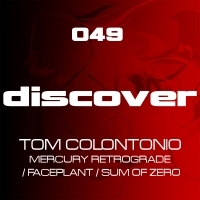 2008 was a huge year for Colontonio with massive releases on both Discover and Vandit and a rising profile on the international DJ circuit. 2009 looks set to be even bigger and this massive EP is the perfect start. With three originals from Tom together with a remix from trance heavyweight Giuseppe Ottaviani - this EP delivers on every level. With support from the likes of JOC, Tyas and Armin Van Buuren together with numerous license requests, this release brings us nicely into the Spring in fine Discover style. 'Mercury Retrograde / Faceplant / Sum Of Zero' is available now from Beatport and iTunes.